It was just about a week ago when we highlighted a potential trade in Signet Jewelers Limited (NYSE: SIG). At the time, we noted that earnings were due and the stock was likely to make a large move after the company announced its results. We then developed a trading strategy for that likelihood. Well, the results are in and that trade has delivered its maximum potential gain. Traders who took that recommendation have a gain of 31% in one week. Since that is the maximum possible gain, it’s time to close that trade. Now, we need to look at whether or not there is another chance to benefit from Signet’s news. You may recall that Signet Jewelers sells jewelry, watches and associated services in the US, Canada and the United Kingdom. Signet’s brands include Zale Jewelry, Piercing Pagoda, Kay Jewelers, Jared and several regional mall-based brands. Through all of its brands, Signet operates more than 3,500 stores and kiosks. The company also has an operation that allows it to keep its costs down. Another division of the company is involved in purchasing and converting rough diamonds to polished stones. While the business is performing well from a financial perspective, the company faces concerns related to its operations. Signet is facing a massive class-action arbitration case in which 69,000 women who worked for Sterling Jewelers alleged that the company discriminated against them in pay and promotion practices. The allegations are lurid and were detailed in The Washington Post some time ago. There are also questions related to the company’s accounting and these, too, have been extensively covered in the media. As if this wasn’t enough trouble, the company’s CEO abruptly resigned last month. Signet Jewelers jumped as much as 15% after its earnings announcement. Earnings and sales beat expectations and the company told investors that it had completed the acquisition of a digital platform to expand its offerings. The company bought R2Net for $328 million in an all cash transaction. R2Net is the owner of JamesAllen.com, a fast-growing online jewelry retailer, as well as Segoma Imaging Technologies, which provides R2Net machines to enable delivery of next-generation digital shopping experience for jewelry. The acquisition will bring together Signet’s jewelry retail business with R2Net’s world-class innovation capabilities and digital technology to create an enhanced customer shopping experience and accelerate Signet’s execution of its Customer-First OmniChannel strategy. R2Net maintains global operations, including technology innovation centers in Israel and 24/7 customer service operations in Frederick, Maryland. R2Net’s innovative technologies include proprietary 360-degree Diamond Display Technology, Virtual Ring Sizer and Ring Try-On mobile application. The transaction is expected to close this quarter. On earnings, the company reported earnings per share (EPS) of $1.33. The average estimate of seven analysts surveyed by Zacks Investment Research was for earnings of $1.10 per share. The jewelry company posted revenue of $1.4 billion for the quarter. This also beat Street forecasts which were for $1.34 billion. Signet reiterated its fiscal 2018 guidance for a same-store sales decline by a low-to-mid-single digit percentage and EPS of $7.16 to $7.56. Analysts had been expecting EPS of $6.60 and are likely to increase estimates after the company’s strong quarter. What’s Next for the Stock? As traders, we need to be aware of the news because it can help us develop expectations for the company and the stock. SIG soared on the news as shown in the chart below. At the bottom of the chart is the RSI(2) indicator. This is the familiar relative strength index (RSI) but is calculated using two periods of data. The traditional calculation uses 14 periods. That calculation is unresponsive to market action as shown below. RSI(14) rarely gives trading signals while RSI(2) frequently moves from oversold lows to overbought highs. Thursday’s price action pushed the RSI(2) indicator into overbought territory while the slower RSI(14) is not giving any signal yet. The question is what happens when a stock makes a large move like this and becomes overbought. Back testing can help understand the answer to that question. In the past ten years, SIG has only had one other day where the price action was similar to Thursday’s. The stock was lower a month later but that is not enough data for a valid test of an idea. To get a better picture of what is likely to happen, we expanded the test to include the stocks in the S&P 100 index. With this test of 100 large cap stocks, we have 69 cases of similar market action since 1970. On average, one month later the stock is down 2%. Stocks fell 73.9% of the time in the test period. Given the historical track record, we should expect SIG to consolidate or even decline over the next month. With this time frame, we should focus on a trading strategy for options that expire on September 15. Based on the expectation of a decline, we could buy a put option. This is the simplest strategy to use when expecting a decline. However, put options are relatively expensive. By paying a high price to enter the trade, we need a large decline in the stock to generate a profit on the trade. Historical testing tells us that while a large decline is possible, the most likely outcome is a smaller sell off in the stock. 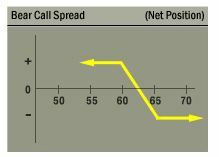 To benefit from an expected small move in the stock, a bear call spread could be used. This trade uses two call options. Both have the same expiration date. One call is sold and a second call at a higher exercise price than the first call. The short call generates immediate income. The long call manages the risk of the trade. The maximum gain is the net premium received when the trade is opened. The maximum possible loss is the difference between the exercise prices less the premium received. This is summarized in the diagram below. For SIG, a September $65 call could be sold for about $1.70. The $70 call with that same expiration date can be bought for about $0.40. Since each contract represents 100 shares, this trade will generate immediate income of $130. The maximum risk on the trade is $370. The potential gain is equal to about 35% of the amount of trading capital risked. This is a short term trade that will be open for less than one month. As a short term trade, it is based on the price action of the stock and ignores the fundamentals of the company. In the long term, Signet does present a compelling valuation argument for owning the stock. It’s possible to have a bullish opinion of the stock in the long term while seeking to benefit from a potential decline in the stock in the short run. This highlights the difference between trading and investing. A trader is focused on the stock, not the company. An investor is focused on the company. Another difference between the two approaches to the market is the size of the expected gains. For SIG, it was already possible to record one gain of more than 30% in a week. After that trade, there is now a second opportunity for a short term gain of more than 30%. Investors focused on the long term will likely need months or even years to record a gain of that size in this stock. Traders will have an opportunity to earn far more in short term trades.